On Faking It, “Faking It…Again,” Karma and Amy once again pretended that they were dating, but this time they did so in an effort to save face for Karma’s mom who was the president of PFLAG. “Faking It…Again” passed the Bechdel and Russo test but did not pass the race test. 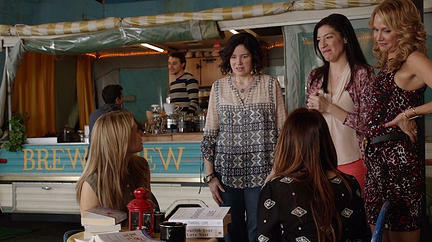 Amy and Karma run into Karma’s mom and her PFLAG friends. While “Faking It…Again” passed the Bechdel and Russo test, it did not pass the race test, and the episode did not pass this test because there were no non-White people in the episode. *****Shane was also in the episode, and while it can be argued that he was not solely defined by his sexual orientation, his removal from the episode would not have significantly affected the plot so he did not pass the Russo test. Posted in Bechdel, Russo, and Race Test, TV and tagged Bechdel, Faking It, MTV, Race Test, TV, Vito Russo. Bookmark the permalink.